As said the camera is offered as originally sold in a sealed and unopened paper bag. 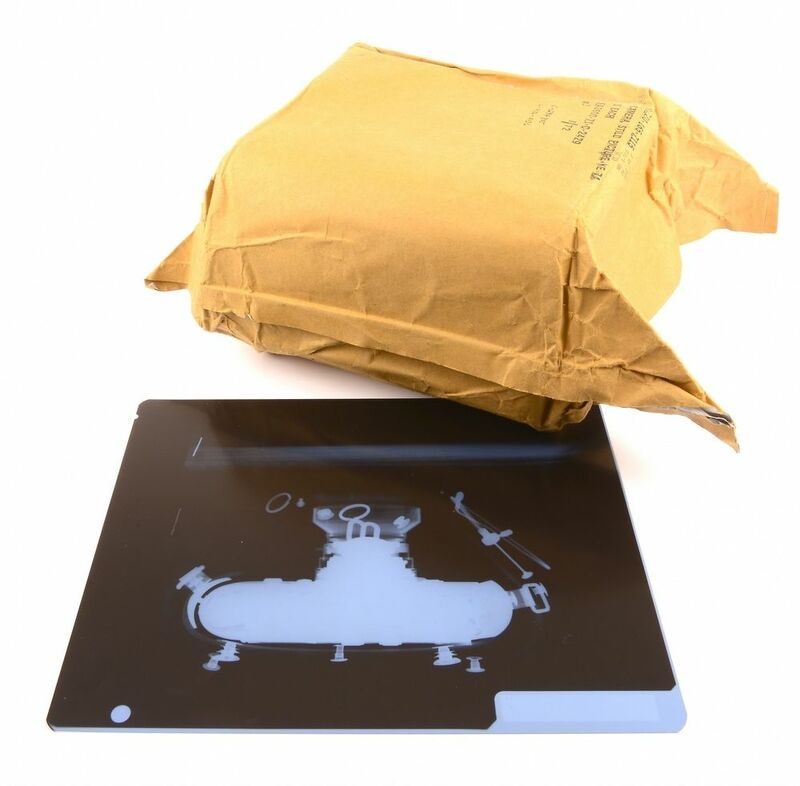 A x-ray photo is included to show the contains of the box. You see these kind of camera more but the rarity of this camera is that it is offered in the original sealed paper bag. Although I do not advise I can open the bag to inspect the camera for you at a Euro 5000 nonrefundable deposit. If you decide not to buy at any reason the deposit will not be refunded as the value will then be less. The set is offered without any warranty. Bank transfers only for this item. Picture no. 7 is a sample photos and not photos of the actual item (thanks to Leica Store Lisse – Foto Henny Hoogeveen). Does that mean a buyer can pay $40,300 and have Schouten keep the bag? Apparently, Schouten also gives you the option, not of buying the camera (or the bag) but of looking in the bag – for $5000. You don’t get the bag, you just get to look in it. How many looks you get for $5000, or whether they charge $5000 a look, remains unclear. In any event, Schouten promises you there actually is a Leica KE-7A in the bag, and not a brick. They’re offering an X-Ray, purportedly taken of the bag, as proof. How you could possibly tell that what you’re looking at in the X-Ray is a KE7A, or whether the X-Ray is even of the bag (could it be an X-Ray of another bag?) I’m not sure. For $43,500, you’re simply going to have to take their word. Whether they plan on charging you to look at the X-Ray remains unclear as well. If a Leica In A Bag is not exotic enough for you, or if your inability to look into the bag absent handing over $5000 in cash to some Dutch guy selling the bag is a dealbreaker for you, Schouten will sell you a “Fake Leica Leitz Sculpture” for $83,750, and they’ll throw in One Day Shipping, anywhere in the world. Absolutely Free. 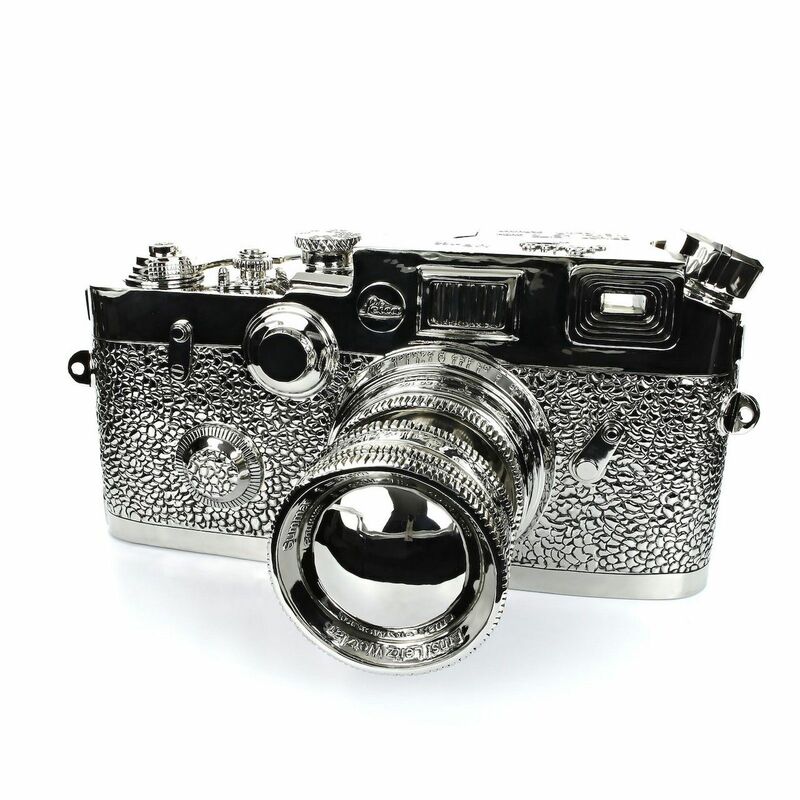 Apparently, the guy who made this made several editions: a “Huge Fake Leica”, a “Small Fake Leica”, a “Fake Leica” in gold and a Fiberglass model. Offered is the “Small Fake” one. It is not in a bag, and is available to be looked at. As best one can tell, you will not be charged to look at it. What model Leica it purports to be is unclear. It has the angled rewind crank of an M4, a red dot of an M4-P, a battery housing of an m6 or m7, and a slow shutter speed dial of a Leica III, which leads me to surmise that the guy who made it is Russian. This entry was posted in Collectible Leicas, Leica Film camera, Leica History and tagged Leica KE-7A on June 26, 2016 by Leicaphila. The “Big Fake Leica” was on display at the opening of the Leica Store in Los Angeles, and was offered for sale at $100,000. Is the “Small Fake Leica” 83% size (which would still be quite massive)? I would have thought a camera was meant for making photographs, not meant for having photographs made of it? No one uses Leica to take photographs… 🙂 You use it as dust collector and bragging item on your shelve. 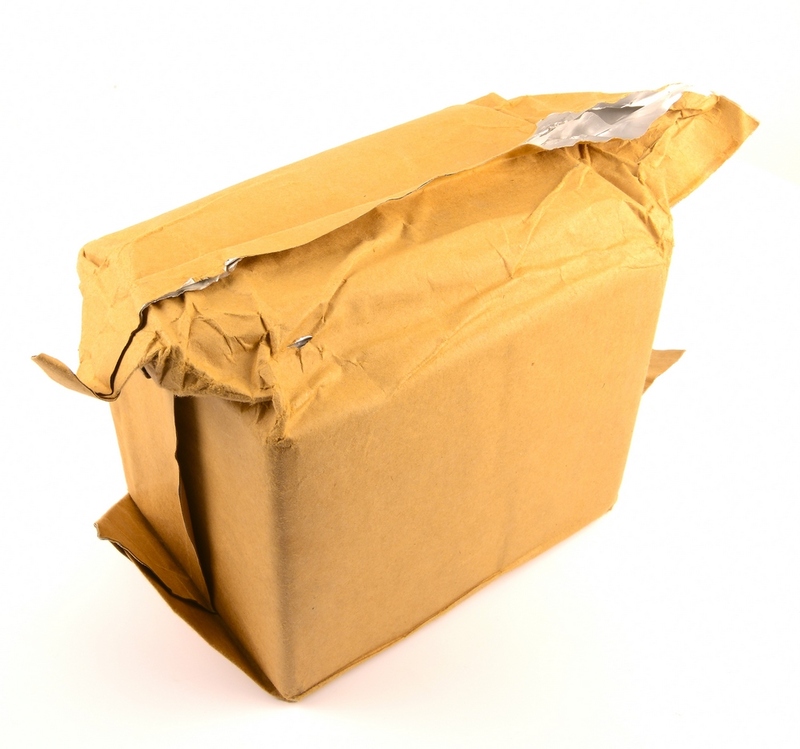 Maybe I should wrap it in a bag, X-ray it and then charge 10.000 for it! I’ve had Leicas in bags X-rayed many times in airports! Actually, a better claim to fame was that there was a time when I was desperate for images, so I took a film into the darkroom of the X-ray department of the local hospital and ran it through the automated processor (having privileges brings – well, privileges!) Amazingly, it worked, although there were a few scratches. You realise that Marco Schouten has now achieved that ‘everybody’is talking about this item, and that you have given him a free advertisement? Oh, I think you don’t get it. This is a U.S. Department of Defense bag. Therefore, it is an expensive bag. This is beyond belief (and I’m not calling into question the veracity of this post). The gullibility of some Leica collectors is astonishing. I laughed until I realised how many times I have had a Leica in a bag X-rayed. Lots. But all in airports. Tadeas is wrong. Of course we use our Leicas to take photographs. Instead of trying to sell his M2, perhaps he should try using it and if he did, I’m sure that, like me, he would gain pleasure and decide to keep it. I have a number of Leicas, mostly the MD, MDa and MD2 viewfinder/rangefinderless bodies, used with wide angle lenses with accessory viewfinders plugged in the top. These cost roughly half what I would have had to pay for M2/M4 bodies and were in better condition. In use, on the streets of Blighty, nobody notices me as what I hold does not really look like a Leica. So no, Tadeas, we do not use them for bragging or to put on shelves, mine live in their camera bags.